If you get the chance to listen to Doug Varone — to his insights into dance, into movement, or even just into what it means to live and create — it can be so riveting that you just might forget. You might forget that this can only be part of the story, because in three or so decades of choreographing and performing and directing, his impact has been so immense — in dance, theater, opera, film, and fashion. The Company Doug Varone founded thirty years ago — Doug Varone and Dancers — will be at Chicago’s Dance Center of Columbia College on February 8th, 9th and 10th (all at 7:30pm), performing a revival of Varone classics Boats Leaving and Lux, as well as some brand new works. One of them, Nocturne(s), is a set of solos performed by Varone, one that he choreographed in 1987, and another that he choreographed just last year. The company will also perform the duet folded and the trio shelter from in the shelter of the fold, a cycle of episodic, stand-alone vignettes. The idea being that these dances would, when seen together create a varied approach to the same idea. More importantly, as independent works each would have a potent point of view that could stand on its own. Johnny Nevin: You’ve said, “The creation of duets will always be a part of how I see my artistic world unfolding”, and in the performances at the Dance Center of Columbia College, you’ll be presenting your most recent duet, folded. Can you tell us what the idea of the work is? What have you created, in terms of the work’s architecture and movement design, to explore and express that idea? Doug Varone: In 2016, I was interested in creating a suite of smaller dances that were linked together by a similar theme. The idea being that these dances would, when seen together create a varied approach to the same idea. More importantly, as independent works each would have a potent point of view that could stand on its own. The duet folded is part of this suite, entitled in the shelter of the fold, a movement-based inquiry into both public and personal acts of faith. Drawing on my own curiosity about traditional and secularly spontaneous uses of prayer, each dance (approximately 10 minutes in length) explores a different facet in questioning what constitutes faith. To whom are we speaking – and what are we asking for? Is this a mystical or spiritual experience, or simply a dialogue we’re having with ourselves? folded reflects the later statement for me, defining the sometimes brutal struggle to cope with competing ideologies within yourself. This week at Columbia College we are also showing another section of the suite entitled shelter, a trio set to a remarkable score by David Lang. Johnny: There’s an intriguing and brightly optimistic sentence at the very beginning of the About section of your site, dougvaroneanddancers.org. It says “Doug Varone and Dancers has devoted itself to the humanity and virtuosity of dance, reaching out to our audiences well beyond the proscenium arch.” In order to keep building a Dance company over a period of more than three decades, you must have had an idea of relationship, of sharing, with your audience. I wonder if you think that there is anything analogous to the interactions of two dancers, when they perform a duet on stage, in the way that each person in your company shares something with each individual in an audience. This dynamic seemed especially interesting in the light of something else that you said about the duet form in dance: “There’s something so potent and universal in the alliance between two people.” What is there about individuals in your audience that is important in how your art has developed? Doug: This is certainly an interesting way to look at the form and the dialogue we have with our audiences. I have always tried to ‘speak’ through my works and create realistic relationships that a viewer can recognize and acknowledge. That said, I would be remiss if I stated that I have the viewer in mind when I am creating and crafting a work. That process is immensely personal and almost to a point, selfish. I am always trying to create the best work I can for myself, not for anyone else. BUT I have to believe that if the work speaks to me and I have done my very best job at creating, then a relationship with the audience will naturally develop. Each viewer will have their own personal dialogue with the work, and that dialogue is always more about them than it is about me or my dance. Everyone brings their own lives and perspectives to viewing art (whether they realize it or not), and all I am doing is opening their imaginations, hearts and minds to what is in front of them. The trust factor in any creative process allows for unexpected things to occur during the process so I’ve learned not to censor or judge the process while we are in the midst of it. Johnny: When I watched your video Doug Varone’s Duets, I began thinking about this idea of duets — their dynamic, their fundamental impact — and I began to see many dimensions in what you do and what you’ve accomplished that seemed to reflect this idea of interaction, of the collaboration between two individuals. For example, your site lists twenty-nine collaborators from every art form that dance includes. How do you see the overall trajectory of Doug Varone and Dancers over thirty years in the light of all of the different collaborations that have been part of what the Company has become? Doug: The creation of a dance is a super collaborative event. First and foremost it is built upon my relationship with the dancers in the room. The trust factor in any creative process allows for unexpected things to occur during the process so I’ve learned not to censor or judge the process while we are in the midst of it. That sense of collaboration strips pre-existing ideas of what I think the dance should be and our instincts constantly push the dance in new directions. I work the same way with all of my collaborators: composers, lighting designers, set designers… allowing them to SEE what is in front of them, not what I necessarily WANT them to see. That type of dialogue lets me understand my dances from new perspectives, seeing things in them I didn’t know were there. Something within her structures and scoring of instruments in unique ways allows me to believe that I can build a visceral, physical world to match. Johnny: Speaking of collaborations, can you tell us a little about working with Julia Wolfe on her score for folded? Where did that process start? Her music includes a wide range of arrangements and orchestrations; were you directly involved in developing the voicing and scope of the musical construction? What struck you most about what Julia brought to the work? Doug: I have an affinity for Julia’s music and a long history of creating to her sounds. Something within her structures and scoring of instruments in unique ways allows me to believe that I can build a visceral, physical world to match. In the past I have commissioned scores by Julia but the score for this duet is a pre-existing work entitled, Believing. What I love about this particular piece is the journey that it takes and the surprises that unfold within it. It was like a road map that I could graft off of and build a parallel world for. Johnny: In a way, an individual’s own artistic vision and expression is even more foundational than their interactions with others, since that establishes what they can share. One of the works you’re presenting is a remarkable solo called Nocturne(s), where you perform the original work that you made in 1987, along with a second solo that you choreographed thirty years later, both set to Nocturnes by Chopin. What is it like, after thirty years of organizing, choreographing, collaborating, presenting, and everything else you’ve done together with other artists, to return to such a vividly individual expression? Doug: For much of the past 10 years, I was not performing… choosing to remain outside of the work and create with a painter’s brush from a distance. As much as that was satisfying (I love building changing architectures of bodies in space, and for me that can only be done from the outside), I had forgotten what it was like to be inside the work and to inhabit its bones again. At this point in my career as a dancer, I am super grateful that I can still challenge myself with movement that is multi-layered and complex, both physically and emotionally. Returning to the original Nocturne that was created at the beginning of my career was like meeting an old friend again (that sounds ridiculously corny, but I can’t think of any other way to say this). This was the first time I had created in my own skin, with instinct and design, allowing the blur between my own personal movement to dovetail with elements of technique. When I look at it now, it feels incredibly bald, a lot of running and walking with an occasional flourishment of activity. It was personal and human and it defined a vocabulary that I have continued to mine for 30 years. Dancing it now seems like a dream, trying to stay in the present but very much being pulled back by memories of its inception. In direct contrast, the new Nocturne which premiered at Jacob’s Pillow this summer feels ornate, musical and intensely intimate, as if time is running out. As if there are only so many chances to dance again. I feel as if they complement each other beautifully and I am thrilled to be able to dance them side by side, like bookends to my career. 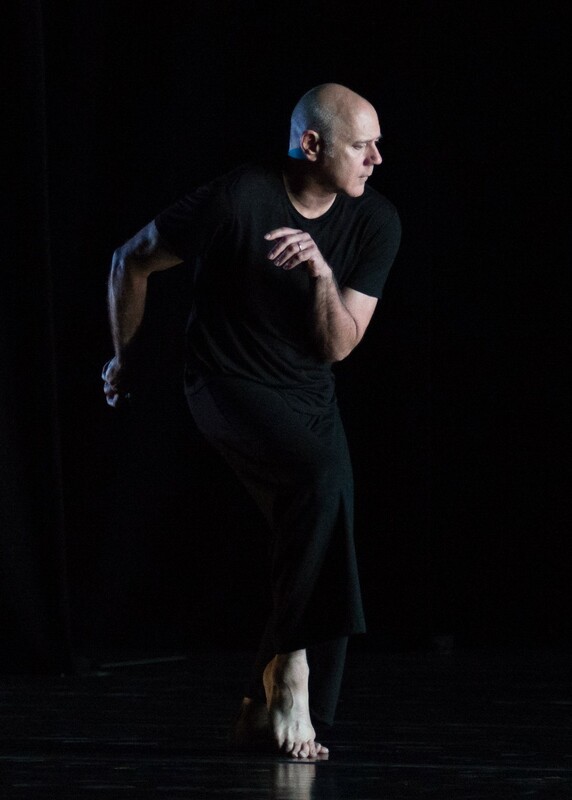 Doug Varone and Dancers will be performing at The Dance Center of Columbia College (1306 S. Michigan Avenue in Chicago) on Thursday, February 8th at 7:30pm, Friday, February 9th at 7:30pm, and Saturday, February 10th, also at 7:30pm. There’s some great information about the show (as well as on additional events, including a Master Class on Wednesday February 7 with dancer Aya Wilson) at Columbia College’s site, and tickets are available online from Columbia College or from the box office at (312) 369-8330. The Dance Center box office is also open for walk up sales Monday- Friday 12:00 p.m. – 5:00 p.m.